Battle of Spain will resume at the Camp Nou when FC Barcelona host Atletico Madrid in the first leg of the UEFA Champions League Quarter Final. This will be their fourth meeting since the start of the season. All the three previous meetings between the current leader and the defending champion of La Liga has all ended in draws. 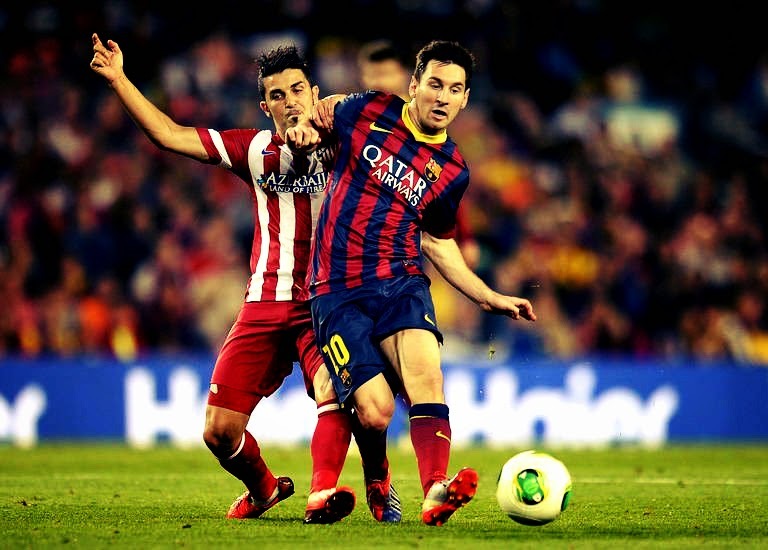 That, simply put how tough this tie is going to be for Barca, especially with the second leg at Vicente Calderon. There is no easy ties in this stage of the tournament, but Atletico Madrid presents a hell of a challenge for us. The only positive is that we don't have to do much travel, and that will help not only in the Champions League but also in the League. 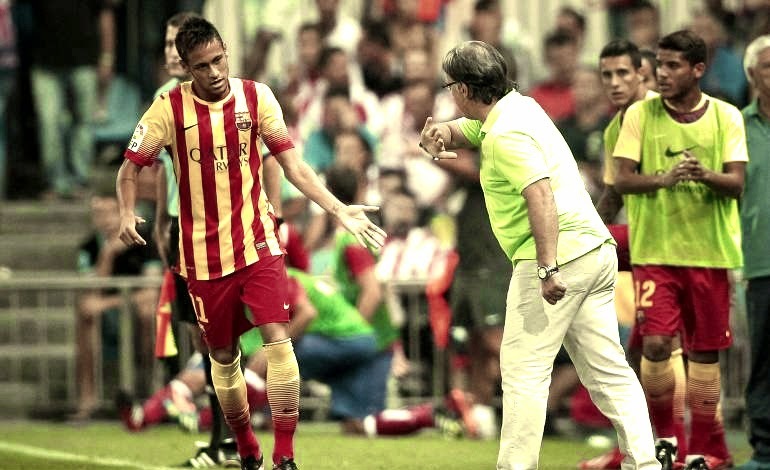 Will Martino's insistence on Neymar hurt Barca? Neymar's continued inclusion in the FC Barcelona's first eleven has raised a lot of questions. At 56 Million or the revised rate of 86 Million, everyone does expect him to start each match but his form has been pretty wobbly in recent times. Meanwhile, Pedro and Sanchez constantly outdo him with their hard work and form. But that hasn't mattered much for them as Neymar's name always finds its place in the starting eleven ahead of those two. Among pundits and fans, there has been unanimous agreement that playing either Pedro or Sanchez ahead of Neymar will help the team offensively. 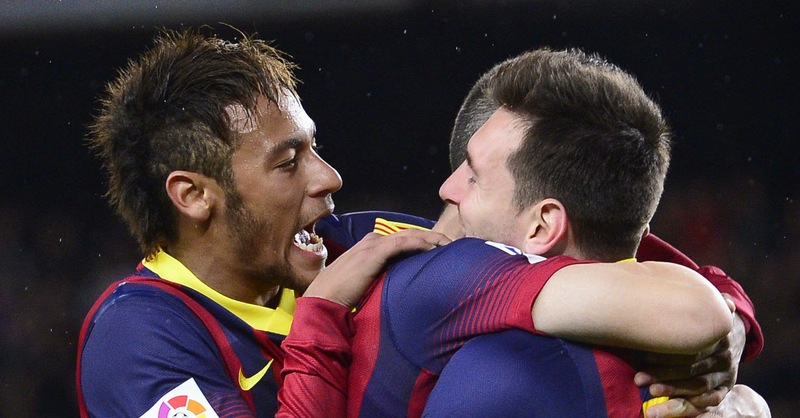 High Definition highlights from Last Night's Barca's crucial victory at Estadi Cornella. Lionel Messi's penalty kick allowed Barca to secure three vital points in their march towards defending the La Liga title. Lionel Messi broke his goal scoring duck at the Estadio Cornello with a brilliantly taken penalty to take Barca's march towards title forward. The award of penalty is going to be the point of discussion this week, especially whether it was a deliberate handball or not. Regardless of that, it is clear that the three points Barcelona picked at their local rivals' home could prove crucial at the end of the season. But there were some uncomfortable questions for Martino to answer, following this tricky win. He may have to clear out whether the decision to continue with Neymar is his or forced upon him. 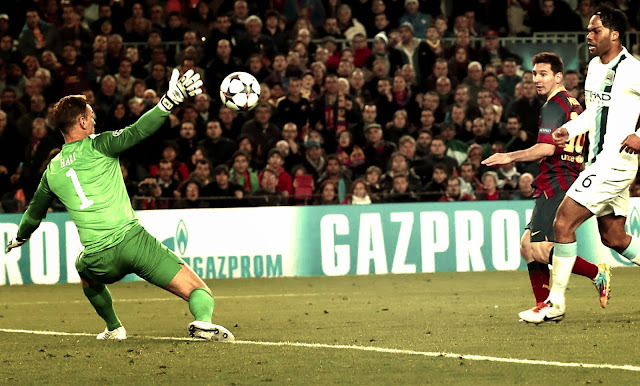 With Valdes out for the season, Pinto started at goal as expected. Alves, Pique, Mascherano and Alba started in defense. I was personally disappointed not to see Bartra in there, but it was understandable as Martino identified this as a tough match. Xavi, Busquets and Cesc formed the midfield. 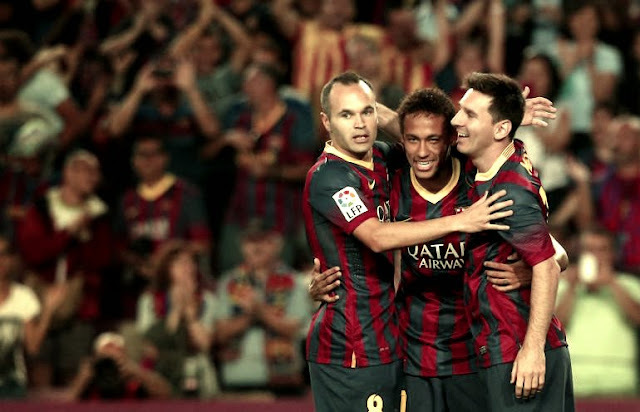 Pedro, Messi and Neymar formed the attacking trio. 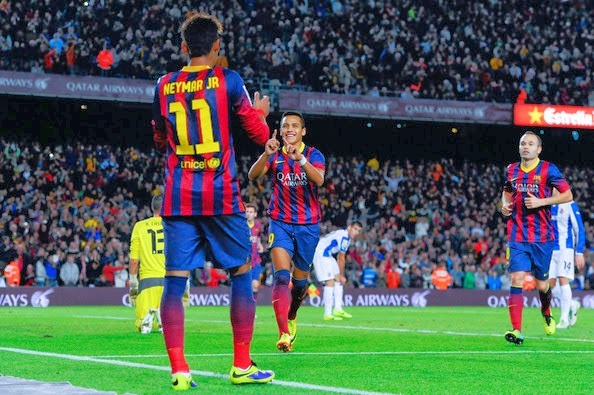 Neymar made instant impact in his debut Catalan derby by providing this nice assist. 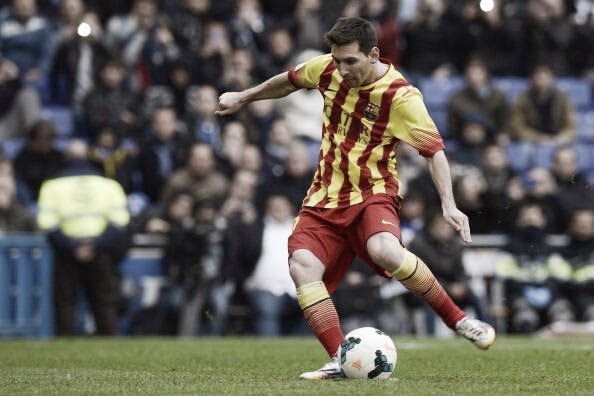 Lionel Messi free kick against Espanyol. Re-Live this brilliant moment ahaead of Barca's derby clash against espanyol tonight. Lionel Messi brilliant free kick against Atletico Madrid. You may argue whether Messi should have been allowed to take the free kick quickly, but none can argue about the skill on display. FC Barcelona continued their recent good form with an impressive 3-0 victory against Celta at the Camp Nou. Neymar scored twice and as expected Messi also got into score sheet. The result became more memorable when it was learned that Real Madrid had gone down to Sevilla. That result put the La Liga fate in our hands, even mathematically. But that good news wasn't enough to raise the gloomy mood of Barca players and fans as they found out the extend of Valdes injury. Victor Valdes had to substituted from the game after he landed heavily on his right foot. The club doctors have confirmed that he has torn the Anterior cruciate ligament of the right knee and would require surgery. The usual lay off for an injury like that is close to six months, which means Valdes who is set to leave Barca at the end of this season may have played his last game in Blaugrana colours. The sad part is that he may miss the World Cup campaign. Messi making a point with his brilliant goal celebration at Santiago Bernebeu. 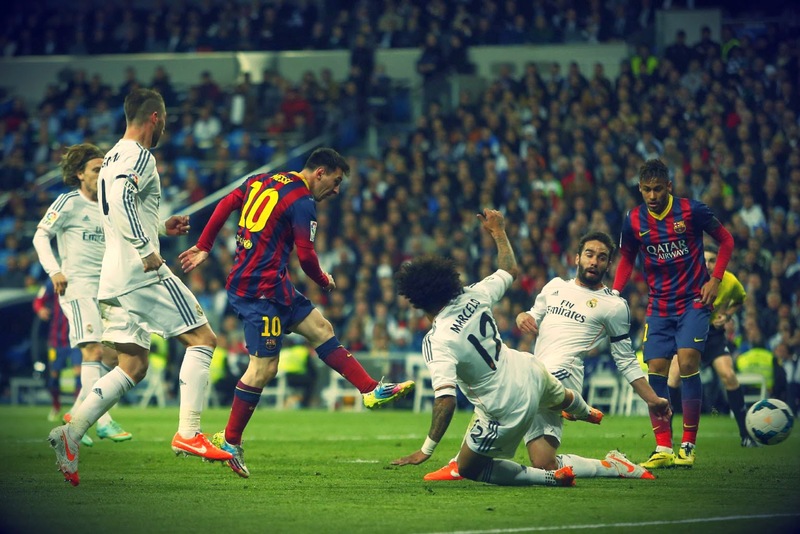 Lionel Messi's brilliant two spot kick which sealed Barca Victory in the latest Clasico. 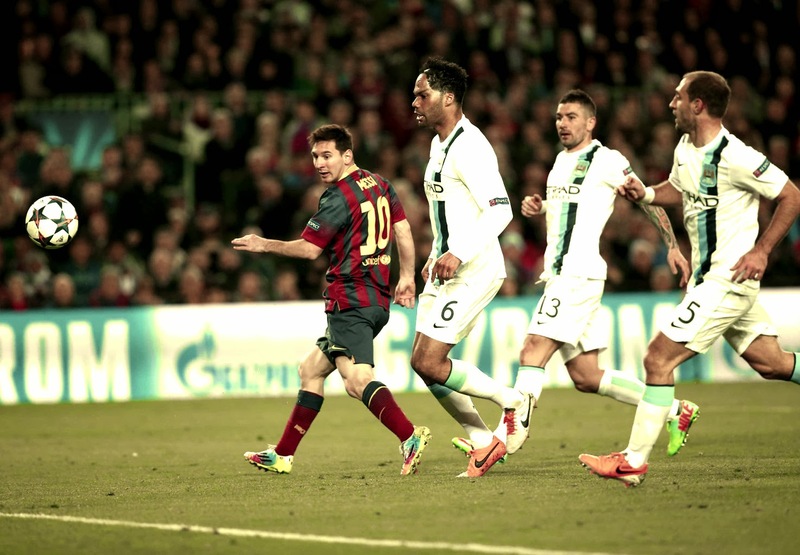 Lionel Messi's brilliant goal which equalised the scoreline at half time. 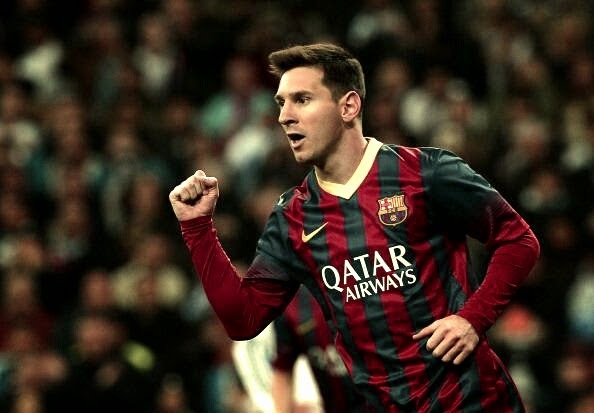 Lionel Messi shows that he is "The Best Player in the World"! Santiago Bernebeu, this was supposed to Cristiano Ronaldo's romping ground, a field where he bulldozes opposition into submission, one where he morph into a matador; but someone forgot to tell that to Lionel Messi. Last night Lionel Messi answered his critics in spectacular fashion in the process re-wrote the history books a number of times. Last week while reviewing the performance against Osasuna, I wrote "Which better place to equal Hugo Sanchez record than Santiago Bernebeu?" It looks like Lionel Messi also had the same thing in mind, his hat-trick has taken him two goals past Hugo Sanchez in La Liga all time scorers record. And he did that in a Stadium where the Great Mexican is worshiped. That was not the only record he broke. He has currently the top scorer in Clasico matches, his performance taking him two past Alfred di Stefano's record of 19 goals. What better place to do that? Also his hat-trick at the bitter-rival's home was the first by a Barca player in their history. 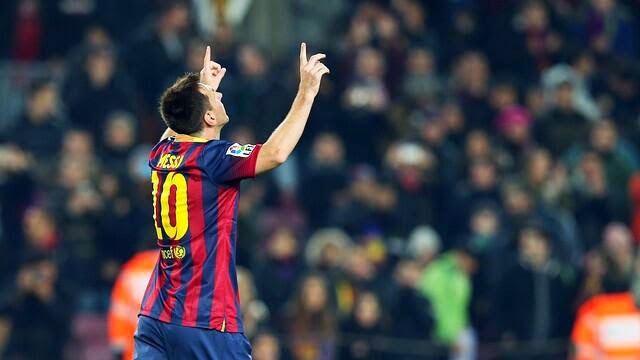 Lionel Messi scored yet another hat-trick breaking a number of records in the process at the Santiago Bernebeu. With 21 goals Real Madrid has become his favorite victim. 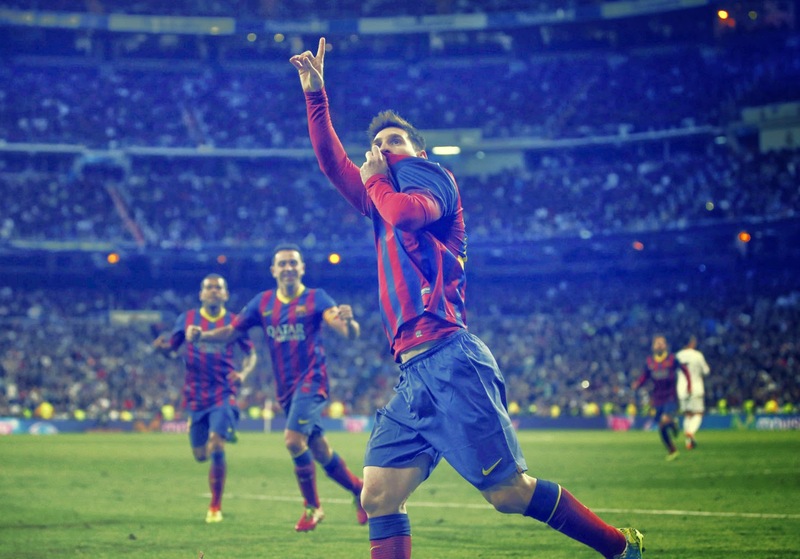 Lionel Messi made all the difference between Real Madrid and Barca in one of the most sensational Clasico we have seen in recent times, to cut Barca's deficit in the top by one point. In a match which swung like a pendulum between each team, Lionel Messi scored three, two from the spot and created the opener. It was classic Clasico, which had goals from Messi and Ronaldo, a Sergio Ramos red card, a controversial penalty awarded for Real Madrid; some Real Madrid fans could argue there was one awarded for us also; it had it all. Even with this victory we still lie at third position, but the difference between the top and us is just one point, and that's crucial. Martino went with the same line-up which featured in the second leg of the Manchester City tie for this all crucial match. Alves, Pique, Mascherano and Alba made up the back four in front of Valdes. Cesc, Busquets and Xavi formed the midfield trio. The front three had Iniesta on the left, Neymar on the right and Messi in the centre. Pinto, Bartra, Adriano, Song, Sergi Roberto, Pedro and Alexis all started from the bench. The Real Madrid side started as I predicted in the preview - Lopez, Carvajal, Pepe, Ramos, Marcelo, Alonso, Modric, Di Maria, Bale, Benzema and Ronaldo. Barca will play the second Clasico of the season tomorrow at the Santiago Bernebeu, knowing clearly that a loss there would put them out of the title race. Barca currently lies seven points behind the league leaders, Real Madrid. A lose will take that to seven points, something which could be impossible to compensate in a three horse race. A draw will not harm Barca much but then leave a lot to chances. In that scenario, anything other than a victory at the Bernebeu will be non-ideal for FC Barcelona. The strange thing is that even if we win, we could see ourselves still remaining in third depending on what happens in the Atletico vs Real Betis match. FC Barcelona could not have asked for a much better preparation going into the game. After the inconsistent start to 2014, Barca looks to have turned their form for the good with brilliant performance against Manchester City and Osasuna at home. Even though these two performances came at home, there is a belief that the team has regained his form and that the results should start showing away from home now. And that belief stems from the excellent form shown by Lionel Messi in the last couple of matches. In an all Spanish affair, FC Barcelona has been drawn up against Atletico Madrid in the Quarter Finals of 2013-14 UEFA Champions League. After the tough tie against Manchester City , Barca fans were hoping for an easier outing this time around, preferrably Manchester United. But instead we are pitted against La Liga rivals from the Capital city. How tough this fixture would be is explained by the fact that the three previous meeting against this two team in the Legaue has ended in draw. FC Barcelona will be playing the first leg at home and that means Atletico has a slight advantage of the seconds leg being a home affair. Barca boys have been peaking slowly in the last couple of matches , so they will be more than ready for the first leg which will be held 2nd/3rd of April. Should Neymar Start at the Santigo Bernebeu? On Sunday FC Barcelona produced their best performance of the season. A 7-0 victory in itself is self explanatory; but the vigor and desire displayed by players on the field made many claim that "The Vintage Barca is Back". May be it's too early to say about that; but it cannot be argued that Barca played some of the their best football's in their last two matches - first against Manchester City and now against Osasuna. The Osasuna victory has raised the expectation of fans ahead of the Clasico. Even though we have struggled in recent away matches and the last two brilliant performances came at the Camp Nou; one might be tempted to believe that the team has turned their form and it should now show on their away records. One of the major factors for this recent turnaround has to be the coming back of Lionel Messi. Messi has been struggling since he returned from the long layoff; some questioned his commitment, especially with a World Cup to play for in Summer. But he has started to re-emerge back and that's showing in our performances. Enjoy FC Barcelona's 7-0 thumping of Osasuna with Ray Hudson commentary. 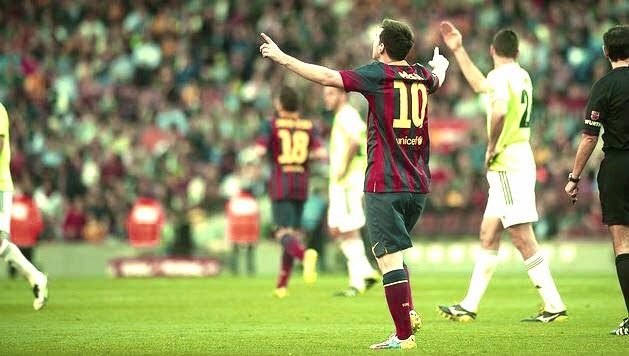 Lionel Messi's record breaking Goal against Osasuna. 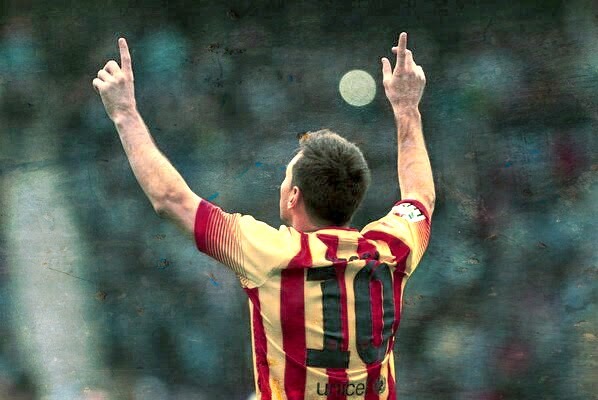 He scored one before and after this taking his total goal tally for Barca to 371 in all matches. 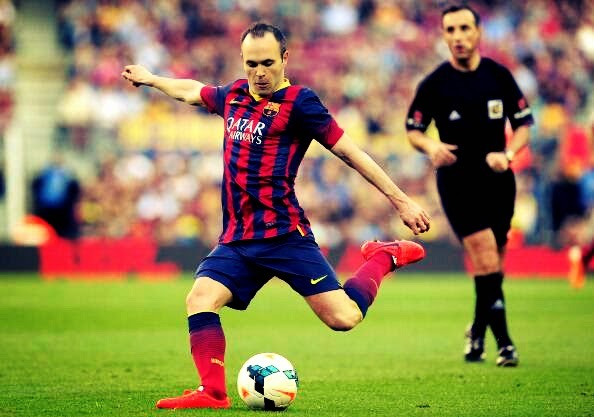 Iniesta does not score much, but when he scores, they are some special like this! Lionel Messi capped off a historic night with a brilliant hat-trick which saw him moving clear of Barcelona's all time Top Scorer Paulino Alcantara to become the top scorer in Barca's history. The very fact that he is just 26 years old make that achievement so unbelievable, but that's something we need to come to terms with. The numbers he could come up with by the time he retires could be astronomical. He is currently just one short of Real Madrid Legend, Hugo Sanchez's all time La Liga record; which definitely would be his next target. Could he achieve that at the Santiago Bernebeu next week? Who knows! Considering the fact that Osasuna was lying on the bottom half of the table, Martino saw it a great chance to give Bartra a start. He, along with Mascherano formed the central defensive pairing in front of Valdes. Alba and Alves completed the defense. The midfield had Xavi,Busquets and Iniesta. Messi, Pedro and Sanchez made up the front trio. 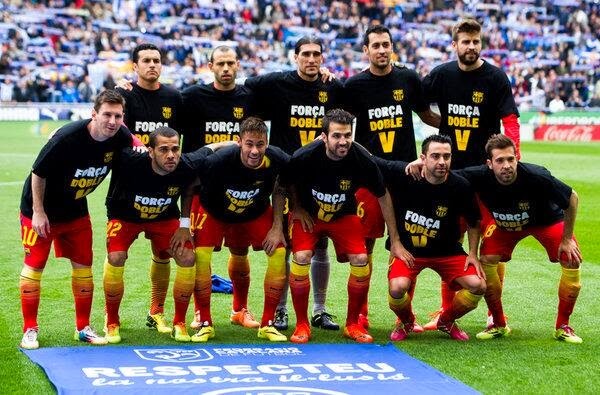 Pinto, Montoya, Adriano, Song, Cesc, Neymar and Tello started from bench. 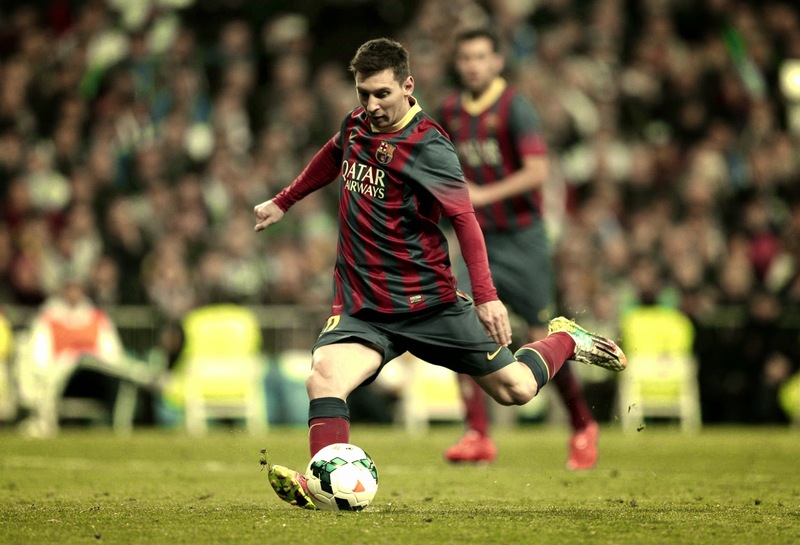 Lionel Messi is back and so his trademark dink over the keeper. Joe Hart had a good night, but could do nothing against Lionel Messi here. 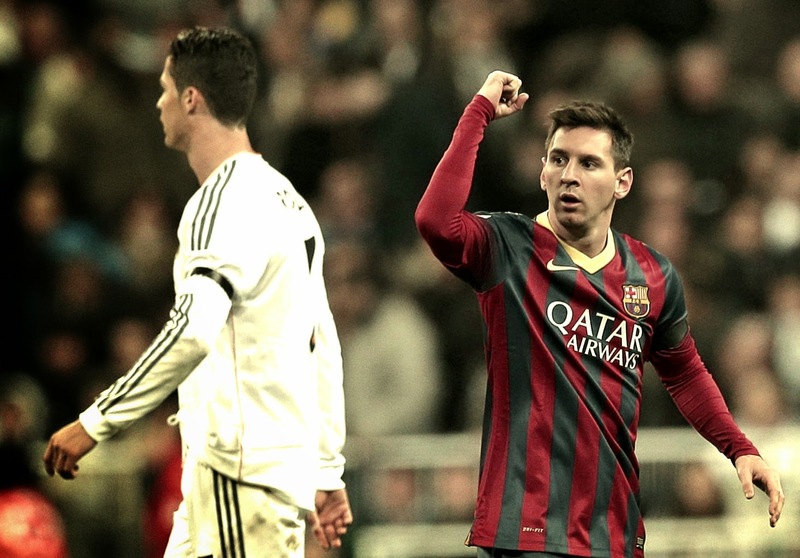 This GIF is a must have for all Messi and Barca fan. Barca booked their place in the Quarter Finals of the 2013-14 Champions League with a comfortable 2-1 victory at home against Manchester City. The 2-1 victory on the night and 4-1 on aggregate see Barca making yet another Quarter Final appearance, their seventh consecutive ones. Manchester City and Barcelona clash was the pick of many pundits for the marquee clash of this round of Champions League. The more than comfortable victory would do Barca a world of good, especially when they have suffered a number of setbacks recently on domestic front. It may be quite unfair to credit this victory all to Lionel Messi; there's a point in that. We had some seriously memorable performances from some other players too, especially Iniesta and Jordi Alba. But regardless of that it was Lionel Messi who made all the difference; not because he scored the vital goal but because he was involved in all that was good on the night. And it started with that darting run into our box to dispossess Aguero, which set the tone and simply showed a hint of his intensions. FC Barcelona secured their place in yet another Champions League Quarter Final with a convincing 2-1 victory over Manchester City at the Camp Nou. With this victory Barca move forward with an aggregate score of 4-1 in two legs against a team which terrorized defending Champions Bayern at their home. So this victory could give us all the momentum while moving forward in the competition.